Blackman and Eastop mention that there are about 30 species of this genus scattered around the world. The three species I have seen are all associated with shrubs that occur in salty desert soils. My limited study of the group has left me thinking the species-level taxonomy is not thoroughly developed. 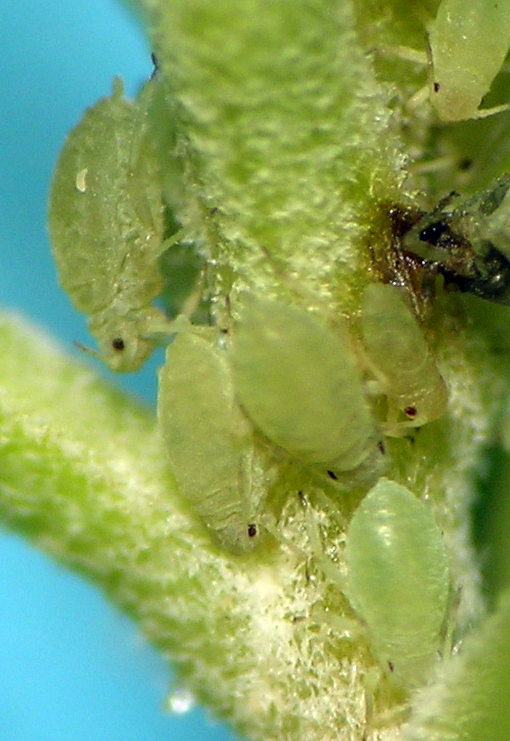 Most people think of aphids as extremely numerous plant pests, developing into huge populations on their host plants. This aphid does not seem to do this at all. The shrub it feeds on, Sarcobatus vermiculatus, grows in salty soil in the desert. The shrubs can be huge and lush, yet this aphid is normally found in very small groupings on the ends of just a few shoots here and there. I have specimens from Washington and Idaho. Brachyunguis bonnevillensis from the wonderfully named Coffee Pot Lake in Washington.